Mapúa University, then called Mapúa Institute of Technology, opened on January 20, 1925 as a night school offering complete four-year programs on architecture and civil engineering and a special two-year program leading to a Certificate of Proficiency in Architecture. It initially had 75 students mentored by 15 teachers—including Don Tomas Mapúa himself, the school’s founder—in a rented portion of a building in Carriedo Street, Quiapo, Manila. In 1926, the Philippine government recognized Mapúa as a legitimate learning institution. During the 1930s, the school began its expansion starting with the offering of mining and chemical engineering programs and became the first private institution in the Philippines to offer electrical engineering and mechanical engineering. At the same time, the annex building was constructed in Doroteo Jose and Misericordia Streets (now Don Tomas Mapúa Street) that housed new classrooms, drafting rooms, laboratories, and other facilities. However, the Second World War did not spare the school from destruction. The results of the damage on the buildings and equipment in the Institute halted operations in its collegiate department. Seniors were automatically graduated even before the second semester began. When American planes bombed Manila, the Mapúa campus was razed to the ground. Mapúa opened its doors again in 1946 and began extensive reconstruction of its buildings; lectures were held in improvised classrooms. Don Tomas’ son Don Oscar B. Mapúa became the executive vice president in the 1950s. Soon after, Don Tomas relinquished active management to Don Oscar. December 22, 1965, was a sad day for the school when Don Tomas passed away. During his stint as second president, Don Oscar continued the vision of his father of Mapúa being the Philippines’ foremost technological institution. Under Don Oscar’s helm, Mapúa was brought back to its old form despite encountering a rough-sailing transformation. On March 17, 1998, Mapúa’s second president passed away, leaving his son, Architect Oscar B. Mapúa Jr., at the helm as executive vice president until December 1999, when the Yuchengco Group of Companies (YGC), headed by Ambassador Alfonso T. Yuchengco, took over the ownership of Mapúa. Ambassador Yuchengco believes that in order to achieve economic progress, educational institutions should help address the demands of the new millennium for quality professionals. Ambassador Yuchengco intended to develop Mapúa into an international center of excellence in engineering, architecture, information technology (IT), business, and social sciences. He envisioned it to be the leader in producing local graduates who offer world-class professional services in the global, knowledge-based, and technology-driven economy of today. In response, the third and present president of Mapúa, Dr. Reynaldo B. Vea, who assumed office on January 16, 2000, has placed the strengthening of the curricular programs on top of his agenda. Through his leadership, Mapúa has been producing countless graduates at par with their foreign counterparts and equipped with world-class knowledge and technical skills. In 2010, under Dr. Vea’s leadership, Mapúa blazed the trail and became the first school in East Asia to receive accreditation from the US-based Engineering Accreditation Commission of ABET (www.abet.org) for its Electronics, Electrical, and Computer Engineering programs. The following year, 2011, EAC-ABET granted accreditations to five more engineering programs: Chemical Engineering, Civil Engineering, Environmental and Sanitary Engineering, Industrial Engineering, and Mechanical Engineering. Two of the Institute’s computing programs were also granted accreditation by the Computing Accreditation Commission of ABET – Computer Science and Information Technology – that same year. Mapúa now has a total of 13 programs accredited by the two commissions of ABET. Mapúa now holds the most number of accredited programs by any single entity in the country. 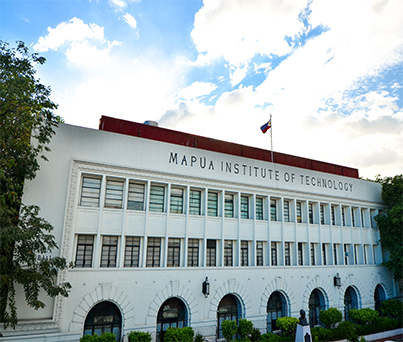 Further elevating the quality of engineering education in the country, Mapúa closed 2014 with another accreditation by the Philippine Technological Council – Accreditation and Certification Board for Engineering and Technology (PTC-ACBET), the representative of the Philippines in the Washington Accord. PTC-ACBET awarded its highest level of accreditation to Mapúa’s Industrial Engineering, Civil Engineering, Electrical Engineering, and Electronics Engineering programs. On February 2016, four more programs of the Institute were granted PTC accreditation, namely, Chemical Engineering, Computer Engineering, Environmental and Sanitary Engineering, and Mechanical Engineering. These accreditations were made possible when Mapúa adopted the Outcomes-Based Education (OBE) approach in 2006. OBE is a rigorous learner-centered approach to education that focuses on outcomes, which are abilities and competencies that acquire by the time of their graduation. The Commission on Higher Education also recognizes Mapúa’s Civil Engineering, Chemical Engineering, Computer Engineering, Electrical Engineering, Electronics Engineering, Mechanical Engineering, Environmental and Sanitary Engineering, and Information Technology as Centers of Excellence (COE) while its Industrial Engineering program is recognized as a Center of Development (COD), the most number among all Philippine engineering schools. In 2016, Mapúa, in line with the country’s transition to a K to 12 system of basic education, opened its doors to Senior High School students, applying the same high quality of education that the Institute is known for. It offers all the four strands of the Academic Track – Science, Technology, Engineering, and Mathematics Strand (STEM); Accountancy and Business Management Strand (ABM); Humanities and Social Sciences Strand (HUMSS); and General Academic Strand (GAS). Mapúa has also gained recognition in terms of its research capabilities, having research projects that aim to solve problems of industries and communities worldwide. With this, the number of research publications in reputable and internationally refereed journals has increased, a significant criterion for the university status grant. With the grant, Mapúa commits itself to deliver the high quality of education it is known for through the years and produce more competent and skillful graduates that will introduce and spread the Mapúan’s tradition of excellence across the globe. Mapúa University faces the coming years with a strategic objective of fully transforming itself fully into a Digital, Research-driven, Outcomes-based and International Domain (DROID). This is hinged on its vision to firmly and formally join the ranks of the world’s best universities. With a long tradition of excellence and continuous improvement the vision could well be within reach.